Members of the Global Voices community met this morning on IRC chat to discuss the Reporters Without Borders Handbook for Bloggers and Cyber-dissidents. It was an amazing group. Click here for the transcript. We had a pretty strong argument about whether the use of "cyber-dissidents" is appropriate for the handbook, or whether the word "dissident" will frighten off a lot of people who would benefit tremendously from the guide. (I gave my own concerns about the issue in the review I wrote of the Handbook.) There was a wide range of rather strong views. There was also a fairly involved discussion of anonymity and credibility. And a question of the Handbook's goals: to facilitate blogging or to facilitate online free expression more generally? Should people be pointed to options other than blogging when other options might be safer or more practical under specific local conditions? We're hoping that the Global Voices community will start using the GV IRC channel at irc://irc.freenode.net/#globalvoices to continue talking about these issues, and to orchestrate projects of common concern. "Today, The Beijing News dutifully reports on new regulations to control the internet, saying that the incitement of demonstrations on websites will now be banned. Juxtaposed with the story, however, is an admiring photograph depicting the thousands of anti-war protestors gathered in Washington on Sunday. We like to think that the irony was conscious." Admiring? Or terrified? Clearly the authorities are connecting the need to prevent political protests and spontaneous activism with the need to tighten controls over online information. The headline reads: "The Internet is forbidden from inciting illegal protests." Chinese news reports make it clear that the regulations include internet bulletin boards (BBS, as they're known in China) and SMS mobile text messaging. Should the regime be nervous about these technologies? You bet. After all, just a short flight away from Beijing in Seoul, South Korea sits a President who was elected thanks to a grassroots youth political movement galvanized by the online citizens' media news site OhMyNews, but which couldn't have been successful without the mobilizing power or chatrooms and SMS text messaging. As Sophie of China Digital Times points out, the number of forbidden content-categories has been expanded from 9 to 11, and all of those new categories relate to people's ability to organize online. Reporters without Borders and Roland of the EastSouthWestNorth blog have English translations of those points. Roland of ESWN has pointed out that in China, the internet bulletin boards and chatrooms are more powerful than blogs. Why? One big reason, he says, is because professional journalists use internet bulletin boards as a place to anonymously post stories their editors won't publish because they were too politically sensitive. Putting them on a blog leaves the individual too exposed and too potentially traceable. So Chinese who want to find alternative news know that the BBS are where they're most likely to find it. It's not clear whether the new regulations cover blogs or not, but if they cover BBS there's no reason they wouldn't cover blogs. (UPDATE: it appears they definitely do.) But blogs don't actually appear to be a major concern right now. All the blog hosting services like Bokee, Blogcn, and Blogbus are required to censor and police the blogs on their services anyway. And all the independent bloggers were required to register their identities earlier this year. So from the government's perspective the blogs have been sufficiently neutered. The BBS and SMS are what they fear. An example of this fear is how the government recently banned all further internet forum discussion about rural democracy and unrest in a village called Taishi. More on the Taishi story from the tireless ESWN here, here and here. The list of content that online news sites are not allowed to report includes "state secrets." Roland provides an example (scroll down to the bottom) of how arbitrary the definition of "state secrets" can be, and how people often find themselves in possession of documents (handed to them by officials) which are not marked anywhere as classified - but then they are busted for possession of them later. Charges of reporting state secrets could also be levied in this manner - as an excuse to nail somebody. This tactic has been used against plenty of Chinese conventional newspaper journalists in the past. We are simply reminded that online news organizations cannot escape. It could be extremely easy for a journalist to be nailed for posting "state secrets" on a BBS without knowing he or she had done so. So the Chinese government is trying to extend the same kinds of regulations it uses on mainstream media to the internet - to professional and grassroots media alike. It will be interesting to see just how far they're able to go. With the quiet compliance of the commercial sector I think China's leadership will buy themselves more time in power. Now, before you argue that flashmobs aided by BBS and SMS may still ultimately prevail and bring democracy to China in the longer term, think again. It's going to take a lot more than that. The Chinese Communist Party has learned to control the internet not perfectly, but well enough: Nascent opposition groups have been successfully prevented from using the internet to grow into any kind of national movement. Outside the Communist Party, there's currently no viable alternative group of people capable of governing China. If an altermative is going to emerge from anywhere it will likely be from within the party itself. Yes I know. I've been following all the coverage of China's latest effort to control online news. I was offline for most of yesterday and this morning, and am taking my time to go over all the coverage, read the actual regulations, look at how the Chinese media is reporting it, talk to some people, and come up with something more useful and nuanced than the kneejerk reaction of: "Omigod! The Chinese CENSORING AND CONTROLLING THE INTERNET!!! How evil!!" Not that I think it's a good thing, and it's something I think we should push U.S. tech companies not to support. But let's just say I am not shocked and stunned that these regulations came out. People inside China who do internet-content related business I've spoken to so far are not particularly excited or freaked out by these regulations. This is the reality they have always lived with. It's not fun but they have no choice and won't have a choice any time soon. So I'd like to take a closer look at how the government is seeking to control online news and information, what's succeeding and what isn't, and how people in China are reacting to it and perhaps adjusting. A long, considered, non-hasty blog post is forthcoming when it gets done, in between the stuff I need to do today for Global Voices and other ongoing projects. It is worth noting that these new regulations include two additional categories of forbidden content compared with previously released regulations: 1) information inciting illegal assemblies, demonstrations, marches, or gatherings to disturb social order and 2) information released in the name of "illegal civil organizations." This is an apparent attempt to target the capacity to organize online. "You shall not spread rumours", "You shall not damage state security”, “You shall not destroy the country’s reputation”. There are just three of the 11 commandments ordered by Beijing, on 25 September, aimed at bloggers and websites managers. Reporters Without Borders expressed concern at this latest turn of the screw in an ongoing crackdown on freedom of expression. "The Chinese authorities never seem to let up on their desire to regulate the Web and their determination to control information available on it ever more tightly,” the worldwide press freedom organisation said. “These new rules, announced with a fanfare by the official media, are certainly more intended to frighten Internet-users than to codify the use of the Net,” it said. “In fact there is nothing really new in these 11 commandments, which simply repeat that the party has the monopoly of the dissemination of information and that the media’s task is not to be objective but to relay state propaganda. 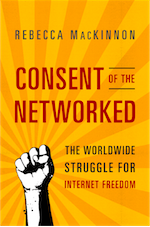 “These moves to filter the Internet are nevertheless a sign that the Internet frightens those in power, in particular during a period of ever greater social unrest. It’s noticeable that the only new elements in the text relate to banning the calling of strikes or gatherings though the Net,” it said. The new rules, ordered by the state council information bureau and ministry of industry and information, are aimed at bringing into line all previous such edicts. 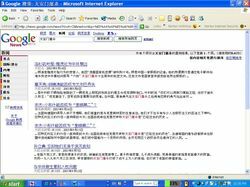 According to the Chinese daily Beijing news (thebeijingnews.com), it contains 11 subjects forbidden to online editors. includes illegal information bounded by law and administrative rules. It is forbidden to organise activities under illegal social associations or organisations. Websites that break these new rules will be shut down and those running them will have to pay a fine that could reach 30,000 yuans (3,000 euros). Reporters Without Borders points out that 62 people are currently imprisoned in China for having posted articles on the Internet that the authorities deemed to be “subversive”. The Christian Science Monitor has a piece today titled China's Model for a Censored Internet about internet censorship in China, and how corporate profit motives could ultimately make the internet a lot less free. Some media ventures have disappointed their overseas investors. Time Warner Inc., the world's largest media company, withdrew from a $50 million Internet venture between its AOL unit and Lenovo Group Ltd., then known as Legend, in January 2004. The ``straw that broke the camel's back'' was the government's insistence that it had the right to monitor all traffic on the service, Richard Parsons, chief executive of Time Warner Inc., said at the media forum. 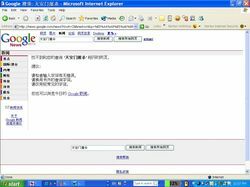 Microsoft Corp., the world's biggest software maker, was criticized in June by Reporters Without Borders for agreeing to block words such as ``democracy'' from its MSN service in China. Companies do have a choice. Investors who care about free speech should reward them for making the right choices. Reporters Without Borders has given Global Voices a sneak peak at the Handbook For Bloggers and Cyberdissidents before its official Thursday release. Click here to download the full PDF booklet. Thanks to Julien Pain for his hard work on this project. It is a valuable gift to the world's bloggers. 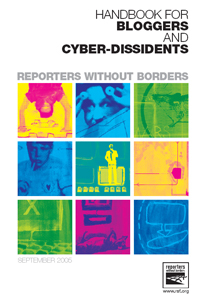 The Reporters Without Borders Handbook for Bloggers and Cyberdissidents is not for any of those purposes. It is the first truly useful book I've seen aimed at the kinds of bloggers featured at Global Voices every day: People who have views and information that they want to share with the world beyond their own national borders. They are often people whose perspectives are not well represented in their own country's media, and certainly not well reported by the international media. Sometimes they are political dissidents, but usually not. Mainly, they are just ordinary citizens with a passion to communicate with the world - and no easier way to do so than by writing, podcasting, and posting pictures on their own blogs. The Handbook for Bloggers is for people who want to be serious participants in the emergent online global conversation: How to set up a quality, credible blog. How to get it noticed. And.. if you're in a country where there government might not like what you're saying, how to avoid getting in trouble when you by-pass the information gatekeepers and talk directly to the world. ...America has a bipartisan human rights policy in China. It is called trade. The idea is that Western companies will bring Western values - especially when they develop the Internet, supposedly an unstoppable force for openness. But Shi's fate is the latest piece of evidence that it's not working out that way. ...In many important ways, foreign investment has been good for the Chinese people. It has lifted living standards greatly. China's desire to trade has encouraged new permission for thousands of Chinese to study abroad, which is also a force for liberalization. Foreign businesses have promoted legal reform, although largely in commercial law. But let's not pretend that foreign investment will make China a democracy. That argument was born out of self-interest. Because China is too lucrative a market to resist, Western businessmen have ended up endorsing the party line through their silence - or worse. They are not molding China; China is molding them. Starting in the 1970s, U.S. companies with business in South Africa united in opposing apartheid there, and although their pact did not end the racist system, it is credited with bringing mainstream attention to the problem. U.S. Internet companies should follow that example and agree on guidelines for operating in China while respecting human rights and use the heft of the group to resist Chinese pressure, said Lori Tansey Martens, president of the International Business Ethics Institute in Washington, D.C.
"I'm not asking Yahoo to do it alone," said Pain of Reporters Without Borders. "I'm asking Yahoo to discuss it with Google and Microsoft and find a common position." Some suggest that U.S. companies continue following Chinese law but be a little less cooperative about it. 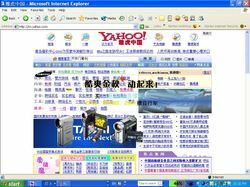 Danny O'Brien, activism coordinator for San Francisco's Electronic Frontier Foundation, suggested that Yahoo call attention to any future requests for information from the Chinese government. "A perfectly reasonable thing for Yahoo to do within the legal framework is to comply but announce it publicly," O'Brien said. That's a strategy Google has used when complying with legal requirements in the United States to remove links to copyrighted material. Companies could be less cooperative by using encryption and anonymizing technology, and avoiding storing unnecessary information about users, said Jonathan Zittrain, co-founder of the Berkman Center for Internet & Society at Harvard Law School and Oxford University's chairman in Internet governance and regulation. No one suggested boycotting the major U.S. Internet firms. "How much choice do you have if all of these companies are doing this?" asked Mickey Spiegel, a senior researcher in the Asia division of Human Rights Watch. "We're not going to stop using the Internet." "I don't think (a boycott) would make much difference," agreed Chinese activist in exile Xiao Qiang, director of the China Internet Project at the UC Berkeley Graduate School of Journalism. Instead, Xiao is focusing his energy on supporting Chinese bloggers and studying how the Chinese are using the latest social networking and Web browsing programs to communicate under the radar of the censors. But there is one activist group that has taken up the cause of Internet freedom in China: investors. Two asset management firms that concentrate on socially responsible investing have penned a shareholder resolution for Cisco Systems, which will come up for a vote at the company's next annual meeting. The resolution urges the company to draft and implement a human rights policy. It was submitted by Boston Common Asset Management, which holds 104,200 shares of Cisco common stock, and Domini Social Investments. 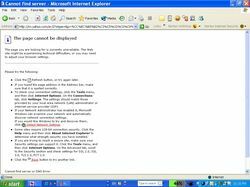 Cisco unsuccessfully challenged the resolution with the Securities and Exchange Commission. The company said it has already done what the proposal suggests. Over at Global Voices, Chinese blogger Frank Dai has a detailed post on how Chinese bloggers are reacting to the Chinese government's blockage of Skype. Virushuo cited a story of a Shenzhen Skype user surnamed Wang, who reported that his internet access was down and some ports were blocked. He consulted with the personnel at China Telecom, who replied that he had been added to a black list because he used Skype-Out and required him to guarantee not to use it any more. They also warned that next time he would be fined for 3000 Yuan, about 370 US Dollars. There is much applause in the blogosphere for today's Washington Post Op-Ed condemning Yahoo! 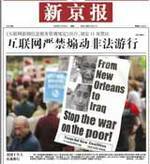 for its collaboration with Chinese authorities in the conviction of Chinese journalist Shi Tao. Yahoo! co-founder Jerry Yang said the company was merely following Chinese law - it had no choice. But as human rights groups have been pointing out, Yahoo! has been going above and beyond the strict legal requirements for some time. In 2002 it signed the Internet Society of China's Public Pledge on Self-Discipline for the Chinese Internet Industry. This "self-discipline" is reflected in the way Yahoo! filters (censors) its search results. The ONI China Filtering Report describes the process in detail. To illustrate the process, I've taken screenshots to show what happens when you try to search for terms like "Tiananmen massacre" on the Chinese language versions of Yahoo! and Yahoo! News. A big fat error message. Same thing happened when I did the same search on the Chinse Yahoo! News. Same error message, plus the Chinese ISP barred all further requests from my computer's IP address. Punishment for trying to access blocked material. 3) By way of comparison, I repeated the same steps for Chinese Google and Google News searches, both with and without a Chinese proxy. A search on the term "Tiananmen Massacre" returns a long list of results. What do these screenshots illustrate? They show that Yahoo! actively filters politically sensitive terms from within its own service. Even if a Chinese user finds a way to access Yahoo from outside China or via a foreign proxy server, they will still get filtered search results on politically sensitive terms. By contrast, Google does not actively filter. The filtering of Google search results is done only by the Chinese ISP... although Google helps hide this process from Chinese users by choosing not to show results that the Chinese user would be unable to access. As a result, Chinese users of Yahoo! 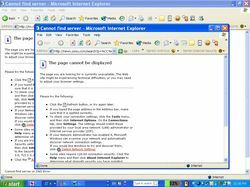 have no way of discovering that the search results they seek actually do exist -- even if they are tech-savvy enough to use a proxy server. This is the same experience that Chinese users have when using home-grown Chinese search engines like Baidu. Google users have a better chance of finding forbidden material if they know how to use proxies, but those who don't (i.e., most Chinese internet users) also have no way of knowing what they're missing. Like their Chinese competitors, these American companies are not being transparent or honest with Chinese users about the fact that search results on their services are being censored in compliance with Chinese legal and extra-legal requirements. A bit of transparency and honesty, at very least, would be a step in the right direction. Sept. 8 (Bloomberg) -- The U.S. Federal Emergency Management Agency's upper ranks are mostly staffed with people who share two traits: loyalty to President George W. Bush and little or no background in emergency management. Director Michael Brown served as commissioner of the International Arabian Horse Association for a decade before coming to FEMA in 2001. Acting Deputy Director Patrick Rhode is a veteran of Bush's 2000 presidential campaign, and Acting Deputy Chief of Staff Brooks Altshuler worked in the White House in 2001 planning presidential trips. the Clinton administration, he said. ESWN (scroll down to bottom) and Angry Chinese Blogger have both posted translations of the summary of an internal Chinese Communist Party Propaganda Department circular, e-mailed by Chinese journalist Shi Tao to a foreign website via his Yahoo! China email account. (Click here for the PDF of the full verdict text in both Chinese and English.) A lively discussion is going on in the comments section of my last post about Yahoo! 's role in Shi Tao's conviction. According to Shi Tao's summary, the Propaganda Dept. circular includes the following instruction to Chinese editors and reporters: "pay attention to any liaison between overseas democratic elements and individual media editors and reporters inside China. If anything is discovered, it is must be reported immediately"
For transmitting this, plus a very general list of measures the government was taking to crack down on dissident speech and prevent unrest, Shi Tao got 10 years in jail. Yahoo! has now responded to Reporters Without Borders and other human rights groups who have strongly condemned Yahoo! 's role in handing over Shi Tao's e-mail logs to the Chinese police. In an email to Reuters, a Yahoo! spokesperson wrote: "Just like any other global company, Yahoo! must ensure that its local country sites must operate within the laws, regulations and customs of the country in which they are based." In Shi Tao's case, Yahoo! had to be evil in order to be legal. But as the discussion on my last post reveals, Yahoo! had a choice. It chose to provide an e-mail service hosted on servers based inside China, making itself subject to Chinese legal jurisdiction. It didn't have to do that. It could have provided a service hosted offshore only. If Shi Tao's email account had been hosted on servers outside of China, Yahoo! wouldn't have been legally obligated to hand over his information. When providing information and communications services in countries where political dissent is illegal, companies like Yahoo! need to ask themselves tough questions about whether they can realistically operate "within the laws, regulations and customs of the country in which they are based" while still upholding their ethical values. Assuming they have some. Even if they don't, they must recognize that helping put dissidents in jail is pretty bad for the corporate image. Is the damage to Yahoo! 's reputation, credibility, and consumer trust really worth whatever money they're making on that Chinese-language e-mail service?